A multiple car collision or chain-reaction accident is one where more than two vehicles are involved. The number of vehicles that may be involved in a multiple vehicle accident can range from three to a dozen. Multiple vehicle collisions occur mostly in high speed, high volume areas like major city roads and highways. Multiple car collisions usually occur when a car comes to a sudden stop, leaving very little time for the driver behind to stop their vehicle. This abrupt stop causes the driver behind to crash into the car in front of them. If another vehicle is behind the driver who crashed, it leads to a domino effect and multiple drivers find themselves a victim of the accident. Because chain-reaction accidents mostly occur on high traffic roads, this initial accident often causes more drivers to apply brakes, leading to their cars swerving or skidding into other vehicle lanes. This can increase the accident’s impact and more drivers may find themselves involved in it. There are laws in each state to determine fault in multiple vehicle accidents. In some states, if a person is found to be more than 50 percent liable for the collision, they won’t be able to recover damages. In some states, a person cannot get compensated for the damages even if they were only 1 percent responsible for the collision. However, Florida follows a pure comparative fault system. Under Florida law, if a personal injury lawyer of a person involved in a multiple vehicle accident is able to successfully litigate their claim, then the amount they’re awarded for damages is reduced by their percentage of the fault in the accident. For example, if a person is awarded $15,000 and the jury found that they were 15 percent at fault, then they’ll receive $12,750 from the $15,000 reward. Furthermore, there was once a legal principle in Florida (now abolished) that allowed the car accident victims to choose the driver they wished to recover all the damages from. For example, let us say that a person was driving car X and was injured in a multiple vehicle collision caused by car Y and car Z. It is determined by the jury that the driver of car X was at 0 percent fault, but car Y is 80 percent at fault while car Z is 20 percent at fault. The driver of car X could choose car Z to pay for all the damages even when they are less at fault. Since, this system wasn’t fair, it no longer exists in Florida. Now, in the current system, the driver of car Y is responsible for 80 percent of damages while that of car Z is responsible for the remaining 20 percent. If you’re involved in a multiple vehicle accident, you’ll have to prove that the accident occurred due to negligence. You must prove to the court that the negligence of another driver led to the accident. For that purpose, you’ll have to prove these elements. It was the duty of the driver to operate their vehicle safely and follow the Florida law. The driver failed to operate their vehicle in a reasonable, legal or safe manner. You were involved in an accident because the driver breached their duty. If you experience an unexpected medical emergency while driving a car and cause a multiple vehicle accident, you might not be considered liable for the accident. That’s because a plaintiff will struggle to prove your negligence. For example, if you have an unexpected seizure while driving a car and it results in you causing a multiple vehicle accident, proving your negligence might not be possible. This would be the case if you have never suffered from a seizure before and didn’t engage in a behavior that would lead to seizure. However, if seizures are a problem for you and you didn’t take your medication before driving, then you endangered other people consciously. In this case, you will likely be held responsible for the accident. Multiple vehicle accidents carry a risk of higher insurance payouts because of extensive property damage and severe injuries to drivers. Even in case the liability is clear, the insurance coverage of the driver or drivers responsible for the multiple vehicle accident will likely not be sufficient to cover all the damage. However, if the driver responsible for the accident has bodily injury liability insurance, they may be able to compensate you for your damages. If the driver who caused the accident doesn’t have any insurance, then you can file a claim with your own insurance company under the uninsured/underinsured motorists (UM) coverage. If you are involved in a Florida multiple vehicle accident, determining liability will be hard. It will have to be determined if someone was speeding or following too closely. This may take intensive investigation and research. The jury will divide liability to all the drivers involved in the multiple vehicle accident depending on their fault. If you have an experienced Florida car accident attorney on your side, you won’t be held liable for the accident if you aren’t at fault. 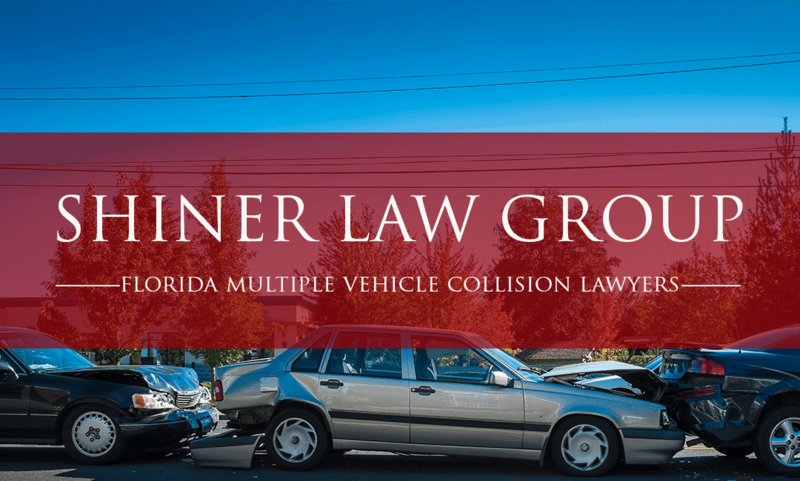 Therefore, when you are involved in a multiple vehicle accident in Florida, hire an experienced lawyer from Shiner Law Group. Our attorneys have experience handling complex multiple car accident cases and they can help you get the compensation you rightly deserve. Call us today at (561) 777-7700 for a free case consultation.